Product prices and availability are accurate as of 2019-04-14 04:24:08 EDT and are subject to change. Any price and availability information displayed on http://www.amazon.com/ at the time of purchase will apply to the purchase of this product. 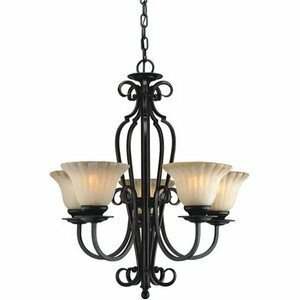 Forte Lighting 2202-05-64 Traditional 5-Light Chandelier features a Bordeaux finish complemented by Umber Cloud glass in a classic design that will enhance any exterior decor theme with style and grace for many years to come. 2202-05-64 is 23-Inch wide by 26-Inch high, and is supplied with 5FT of chain and 10FT of wire. 2202-05-64 comes one per package, and requires five 100-Watt medium base incandescent bulbs (not included), dimmable using a standard incandescent dimmer. Since the company was founded in 1990, Forte Lighting has evolved to one of the leaders in the decorative lighting industry. Forte Lighting is located in southern California's Heart of the Inland Empire. Our state of the art 172,000 square-Foot corporate headquarters and distribution center located in Fontana California provides easy accessibility for shipping and receiving of Forte product. Forte Lighting's product range has gone through a period of remarkable change, with continuous style developments. Forte Lighting's product selection is an inspiring combination of design, style and fashion, with the ability to adapt change to customer needs. At the heart of our product philosophy is our firm commitment to product engineering, and the production of beautiful lighting that combines style elegance and functionality to luxury. While factory modernization is part of this commitment, we will not lose sight our traditional values. Our customers are those who seek out and demand excellence. Forte's commitment to customer satisfaction remains our top priority.